A ground-breaking forum designed to give Far North farmers the tools they need to thrive in the 21st century will be held in Mareeba on Friday 27 April. Full details about this free event can be found in the flyer below or available by clicking here. Efficient Farming Forum will bring together some of the best and brightest minds in agriculture, technology, trends and tourism. 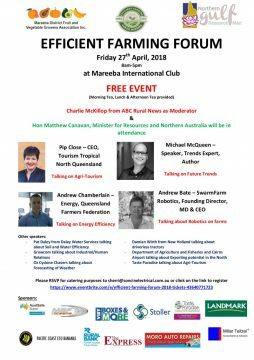 The event will be held from 8am-5pm at the Mareeba International Club, and feature presenters including trends expert Michael McQueen, as well as speakers on agri-tourism, energy efficiency, robotics, weather forecasting, soil & water, human resources, machinery, export and technology. Please register with the organisers, for catering purposes.